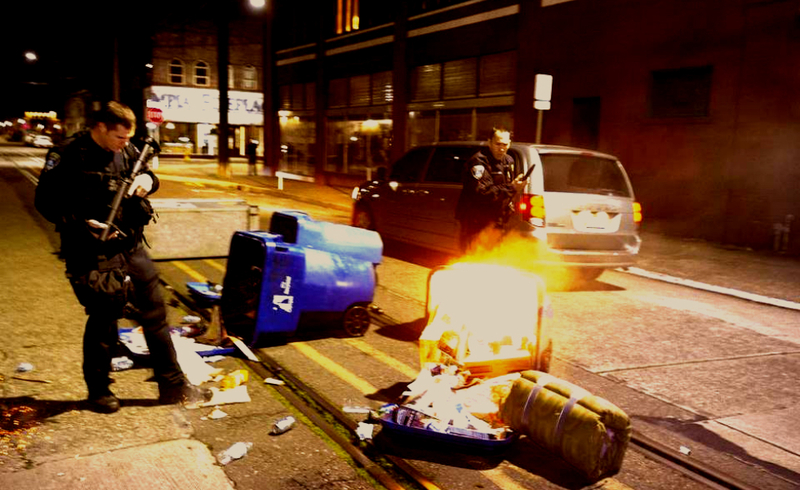 Early in the morning of November 17, 2016, a coalition of law enforcement agencies, including local and railroad police, violently evicted the Olympia Stand rail blockade encampment in downtown Olympia, Washington. 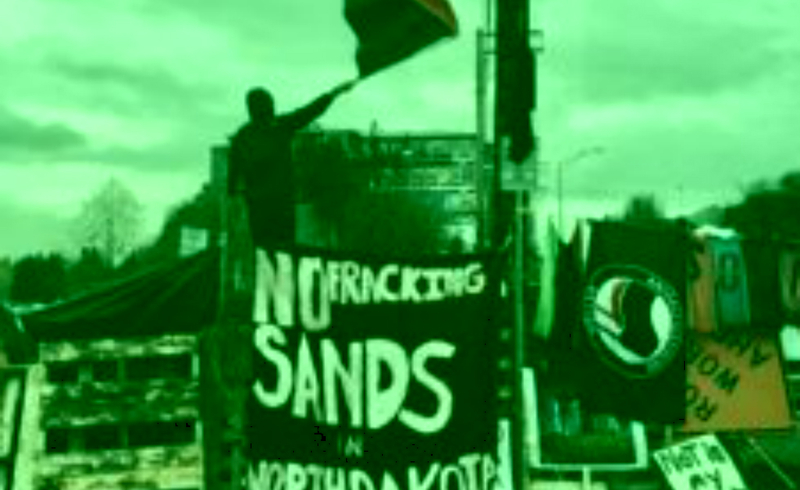 The camp lasted nearly a week and temporarily blocked the shipment of oil-fracking sand from the Port of Olympia to the Bakken Basin of North Dakota, where it would be used to extract oil. The blockade action was, in part, the result of Port Fracking Resistance’s years-long campaign against the Port of Olympia’s complicity in fossil fuel extraction. 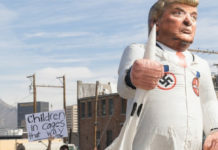 But it was the groundswell of energy arising from both Standing Rock’s struggle against the Dakota Access Pipeline and Donald Trump’s presidential win that made the blockade possible. In the current context, everything has suddenly become that much more urgent. Around 3AM on Friday morning, it became apparent that the raid we’d all been expecting was imminent. Police surveillance of the camp escalated and scouts observed police vehicles moving towards camp. The police forces mobilized a large number of officers and several dozen vehicles for the raid, including a handful of paddy wagons and charter buses for potential mass arrests, as well as many police cruisers and both marked and unmarked SUVs. For the duration of the blockade, including during the raid, a single engine plane suspected to be a federal surveillance craft circled above. This underscores the importance of railroad infrastructure and the threat posed by the blockade to the continuation of business-as-usual. 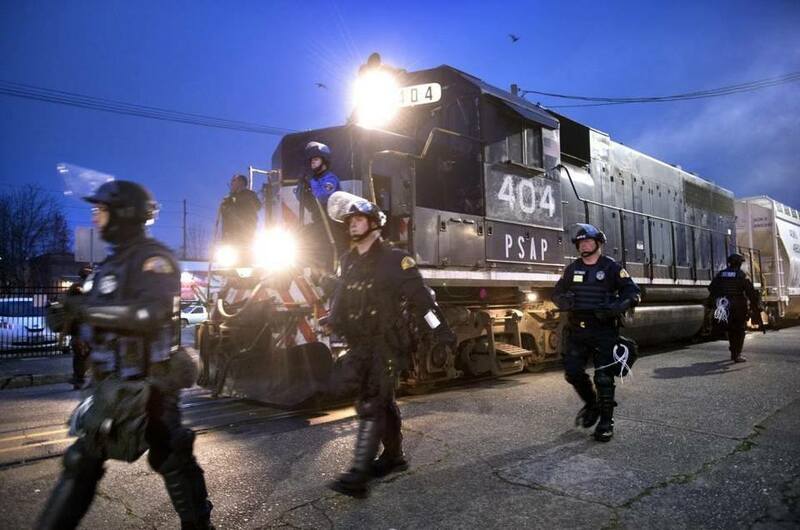 Without this highly coordinated and militarized law enforcement operation, the train could not have left the port. The riot-clad cops secured a perimeter around the camp with crime scene tape and formed lines across the roads leading to camp. 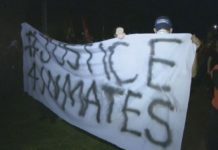 About 20 campers locked arms at the entrance to the camp and 8 were subsequently arrested. Small crowds gathered together outside of the police cordon, having received word of the raid. They chanted “Water is life!” and yelled at the police to let the arrested go. 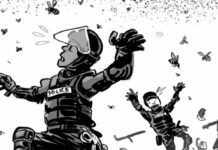 As the numbers grew, so did the tension and ferocity of antagonism toward the police. The crowd first blocked the police van taking the arrestees to jail, then later blocked a garbage truck and climbed on a trailer of equipment, all of which was being used in the demolition of the camp. The police responded by firing pepper balls into the crowd and forcing people off the equipment and onto the sidewalk. The crowd hurled insults at the police while a new impromptu barricade was built across the tracks in the middle of Jefferson Street. Police then fired several flash-bang grenades and advanced forward, removing the barricade from the tracks and slowly driving the crowd towards the downtown core. A stand-off ensued. 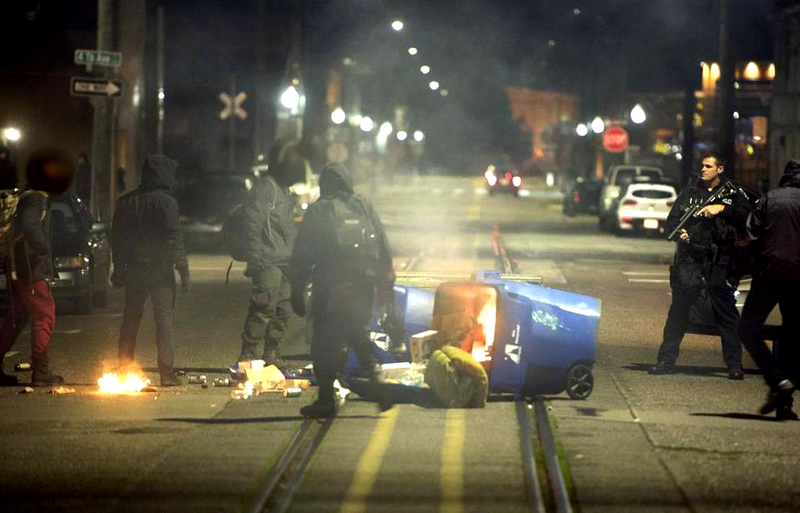 Soon, the cops advanced again as fires were lit and more debris was thrown onto the train tracks. 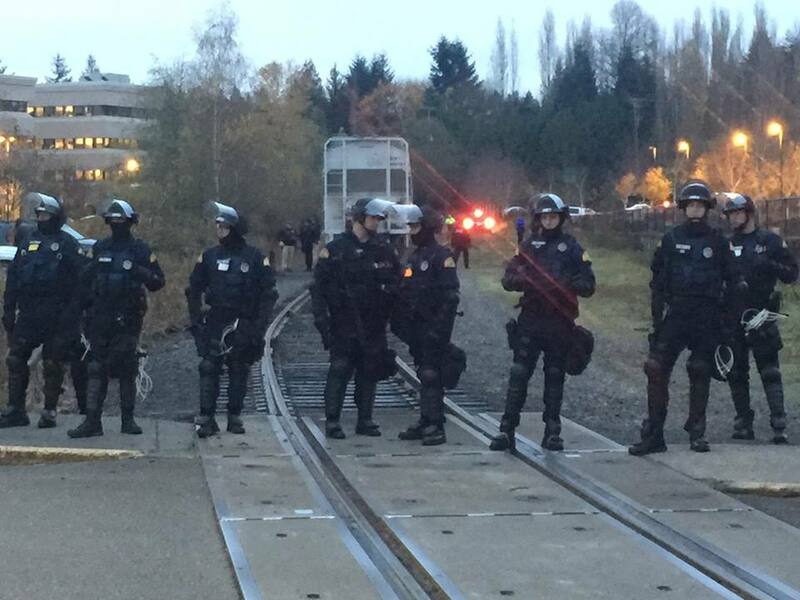 Another line of riot police stood guard on the tracks ahead. The eerie, heartbreaking sound of the train’s horn could be heard in the distance, moving closer. Eventually it rolled into view through the early morning mist, flanked on either side by a line of riot police. A few people tried to climb atop the moving train but were shot with pepper balls and jumped off. The train passed through the scattered remains of the barricade and the camp, headed towards the oil fields of North Dakota. The sun rose, and as the day brightened, the resistance faded into the city like a dream. The camp existed for seven days. 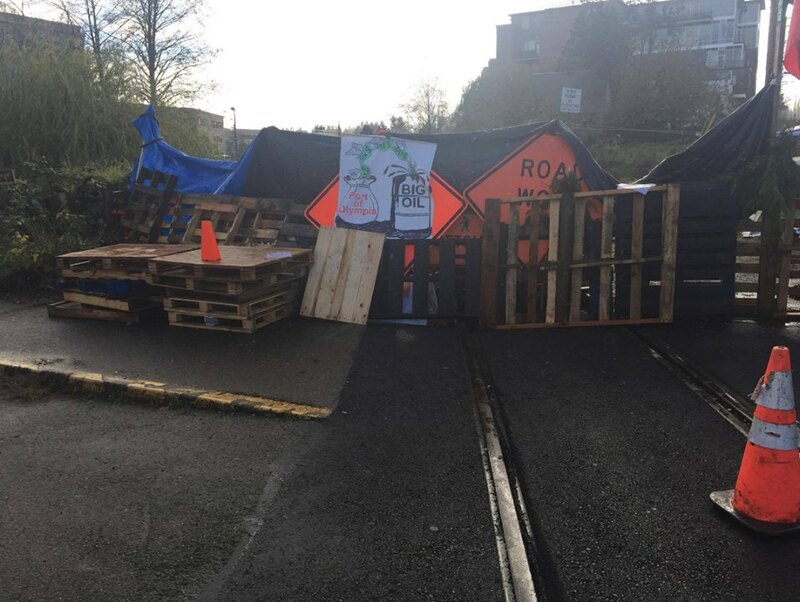 Within its tarp and pallet walls, behind the barricade, we saw what was possible when people gather together to collectively obstruct the normal functioning of capitalism. 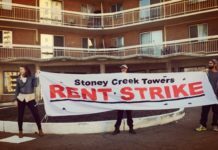 It is clear that direct action is necessary and that this is not a fight that will be easily won. 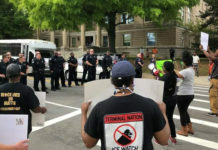 We must continue to use a diversity of tactics, to develop our capacity for self-defense within the increasingly violent political terrain, to learn and share skills and analysis, to connect our struggles across issue and distance, and to find each other. Donate to help us grow and expand!